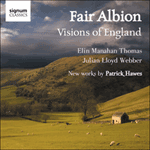 Fair Albion uses large orchestral forces which provide the opportunity to convey a panoramic pastoral scene. This piece was inspired by the undulating Wolds of Lincolnshire—the county in which I was born and lived until my early twenties. For me, it also evokes the peak district of Yorkshire and Derbyshire and the warmth of the people who live there.